I'd let it eat cookies in bed. Looks too collegiate for some reason to me. I’ve had that opinion whenever I see the lighter helmet shell. The navy helmet is what you think of with the Rams. Making it royal makes it look too much like Angelo State. I think it's the royal helmet. Despite it not matching the rest of the uniform there's something about the darker blue helmet that tones down the throwback look. Not if they’re keeping the horns on the shoulders, That’s the one thing that doesn’t really work on the modern jerseys, but it’s also the one thing the team insists on maintaining. Nike will probably give them a pointless custom number font, fixing a non-existent “problem”. I honestly don’t think they’ll keep the shoulder horns, and think the reason is it would make the new jersey too similar to the throwback. The general preference from a merchandising perspective is to have a marked difference between the two so that one doesn’t cannibalize the other in the market. I do think a number update would be welcome, though. The throwback numbers are fine, but they do have that “rec league” style like the Sixers’ numbers, and I think something more stylistically in tune with the curvaceous design of the horns would be welcome. I think a great solution could be as simple as a single color version of the St. Louis numerals, or something tastefully round like Virginia Tech’s numbers. If I’m putting money on it, though, I don’t expect to see that kind of restraint and more than likely it’s going to be an exercise in overthinking. Basically I just like that 2. And add a yellow alternate jersey and pants. That number font fits in line with the font they have been using in the endzones. I wouldn't mind seeing them use it. It's got that old school Hollywood feel to it. So long as it has even weights throughout each number, I could go for it. Fix the collars, pair those with the current throwback pants, and swap the sleeve/shoulder colors to match the throwbacks. And go with a block font. Also, I think that we should prepare ourselves for the idea that Nike is going to screw up the horns. There will still be horns, but they will do something bad like make them look more like actual ram horns. Or they'll add white accents or outlines to the horns for no damn reason. 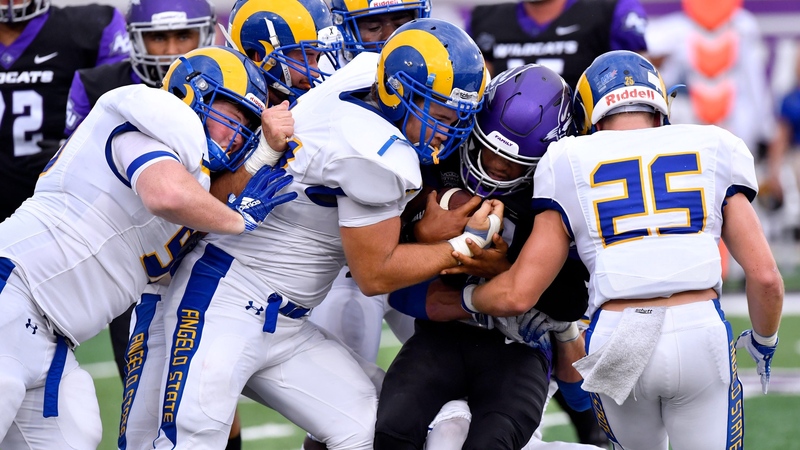 As good as that Angelo State helmet looks, there's no way Nike lets them copy a college team which copied them. Drop the outline on the numbers. It just seems unnecessary to me that contrast beautifully on their own merits. You’ve got it reversed. The outfitter might “suggest” ideas, but it’s the team who “lets” the outfitter execute those ideas (if they like them). If the team wants a royal blue helmet or if they want to add a hint of the growth ring detailing like the originals had, then it shall be. If they said not to touch them at all, then they’re going to remain the same. Simple as that. 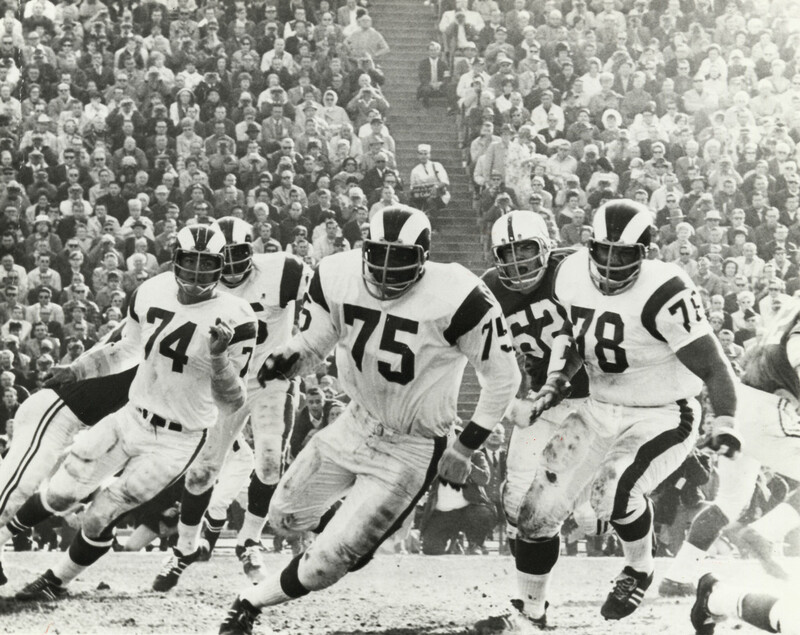 Side note: I think the 60s design below would be a great uniform for the team to start with. 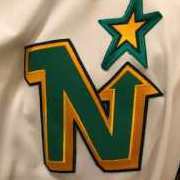 Essentially, it’s just a conversion of the sleeve horn into a shoulder stripe and their current home/road pants. Clean, minimal, and modern. 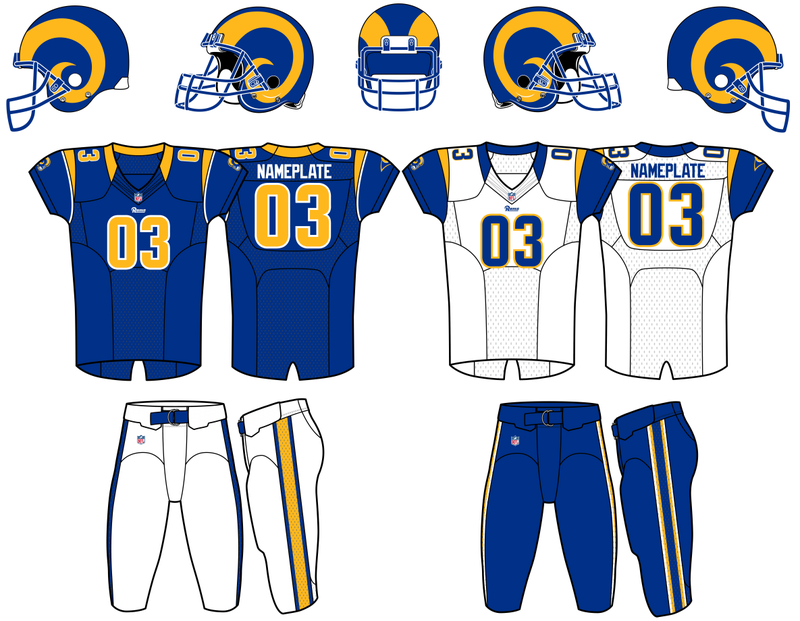 Bringing in gold horns, a gold version of the pants and a blue and gold version of the top (maybe even a tastefully round number set as discussed) would be fit right in with the brief of “a modern version of the 70s/80s/90s throwbacks” and you could also wear it exactly as is in blue and white for a Fearsome Foursome throwback third. Nothings been talked about yet. This didn’t need its own thread though, you could have just asked this in the nfl changes thread. No. Nothing has been announced or mentioned at all. Just the Rams have announced change for the move to Hollywood Park. Also, Can a mod move this to the NFL LA branding thread, or lock this? Nothing official but based off the branding they have used in different mediums I think they will go full powder-blue. Regardless of color they need to bring back the traditional bolt patterns for the shoulders and pants first and foremost.